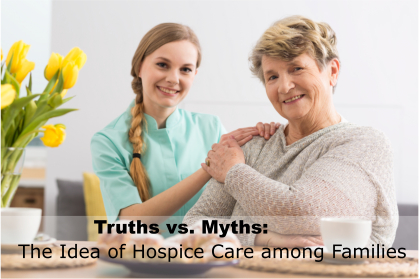 Truths vs. Myths: The Idea of Hospice Care among Families | Ambercity Hospice, Inc. The services provided under hospice typically depend on the patient’s needs and medical condition. Additional personnel including pharmacists, home health aides, dieticians, and other therapists can be involved in the patient care under hospice. Ambercity Hospice, a reliable provider of hospice care in Central Ave Riverside California, still sees many misconceptions about hospice care that exist in the mind of both the public and health care professionals. Today, we are going to debunk those misconceptions and myths to give way to a greater aspect of healthcare. Truth: Hospice care happens to be the place designed for people with life-limiting illnesses; however, this is not where you go to die. Rather, professionals in hospice care are highly-skilled and trained to assist patients in maximizing their lives to the fullest without pain. Hospice care not only helps but changes lives and how patients deal with life. Truth: Medicare beneficiaries pay little or nothing for hospice. Most managed care plans, HMO’s, and insurance plans cover hospice care. So, how can it be costly when it everything’s been paid up? Truth: It is the 21st century. Hospice care can be provided wherever the patient wants to be—in their family member’s home or in their own home, an assisted living facility, or a nursing home. Providers of hospice care in Central Ave Riverside California may provide in-patient units, some correctional facilities, and VA hospitals as well. Truth: In fact, family members are encouraged, reinforced, and even trained by hospice professionals to care for their loved ones. Hospice staff is on-call to the patient and their families 24/7 to help families and friends care for their loved ones. Truth: Conditions other than cancer and AIDS comprise under hospice care are about 50% of its population. How is it all about cancer and AIDS? Truth: Anyone who has a life-limiting, debilitating, progressive condition/illness/ailment is open for hospice care regardless of age. Hospice patients receive care for an unlimited amount of time. There is no fixed limit on the amount of time a patient may continue to receive hospice care. Truth: Quality providers of care in Central Ave Riverside California! provide bereavement services and grief support to family members for up to one year after the death of their loved one/s. This entry was posted in Medical Care and tagged home health aide, hospice care, Inpatient Care, Respite Care, Routine Care. Bookmark the permalink.